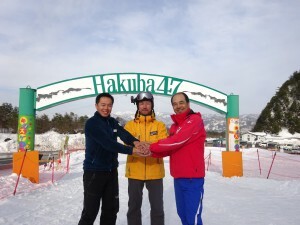 Founder Hiro (middle) with former Japanese Demonstration Team Member, Mr. Yuji Sasaoka (right) and Resort Manager, Mr. Takanori Maeda (left). Founder Hiro was a former groomer at Hakuba Ski Resort, and has valuable knowledge and know-how of the area, so feel free to contact us with any queries. Host to the 1998 Nagano Winter Olympics, Hakuba Valley is a world class resort with quality snow (average 11m), lively village and plenty to do. A large area made up of 10 resorts, Hakuba ski resort is situated in the Northern Alps of Japan, a short distance from Tokyo. The resorts each have their own distinct features and offer any visitor endless options and excitement. Alongside Niseko (Hokkaido), Hakuba is one of the most popular ski fields in Japan and is also the sole partner in Japan of the Mountain Collective; a collaboration of the best independent ski resorts from across the world. 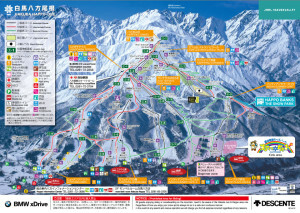 All resorts and villages are interconnected with a punctual and frequent shuttle bus and accessible by a single Hakuba Valley Lift Pass which means less fuss and more fun. 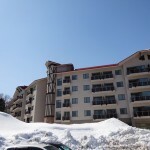 Thanks to its popularity locally, internationally and by professionals, Hakuba Valley has a strong English-speaking community which includes prominent adult and children’s ski schools, and high quality rental services. The main village of Happo, at the base of Happo-One, is a fully functioning town and has facilities and services to match, including a supermarket. The resort is also close to other resorts in the area, as well as significant landmarks such as Matsumoto Castle and Zenkoji Temple. Both can be visited from Hakuba via day tours alongside other tour options which offer unforgettable cultural experiences.Almost all resorts offer backcountry and powder opportunities and also a guided ski service. The excitement extends to early spring, when Heli-Skiing tours become available over the Tsugaike Highlands. Nestled in the middle of the valley Happo-One was the venue for the Olympic Downhill and Super-Giant Slalom during the 1998 Winter Olympics and is the most popular of the resorts which make up Hakuba. With a large area with groomed runs, powder, tree runs and backcountry, the resort is a hot spot for tourists and professionals alike. Backcountry tours are available as well as various activities for non-skiers. The resort is the closest to the main village of Happo and has a kid’s park for the young ones. The resort also has a new ‘Happo Banks’ Banked Snow Park to explore. Hakuba 47 offers in-boundary powder zones and tree runs, with some requiring registration (but not all) to ski in. It also has Japan’s first ever school specifically for freestyle riding, alongside a large freestyle park. The school and park are thoroughly maintained and staffed by current and former pro snowboarders. The resort is north-facing providing riders with quality snow and powder, with English services at the ready when necessary. 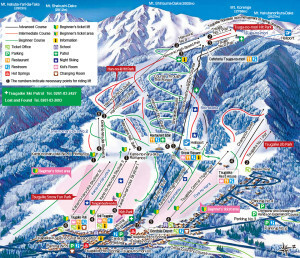 The neighbouring Goryu resort also offers a solid area to ride, with a selection of very long groomed runs. Offering the most freedom of the resorts, Cortina is a small, bowl ski area with a number of slopes which converge in the centre of the mountain. Popular amongst the Japanese, the sides of these slopes are an endless offering of tree and off-piste runs waiting to be ridden. The resort also has some beautiful backcountry which can be experienced through a number of backcountry tour options available at the resort. Flying under the radar is often the case with Iwatake, and often holds the misconception of being a small resort. However Iwatake is somewhat a hidden gem within the Hakuba Valley, holding a 125 hectare premise and a gondola stretching 2183m. Iwatake is not left out, with in-boundary powder, tree and off-piste runs available to enjoy. 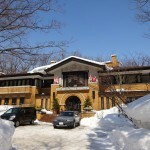 Within Japan, the resort is well-known for its use as a venue for many University ski competitions. Tsugaike hosts the perfect wide and flat grooms at the base for all beginners and is a popular destination for school trips. Up higher are long groomed runs, the longest measuring 4900m and a vertical drop of 904m. Powder and tree skiing opportunities are scattered throughout and extend till early May. The resort also has a small village to relax at after a long day. Norikura sits next to Cortina, and like its neighbour, has a large area allowed just for off-piste and tree skiing. The top hosts a wide field of powdered snow, for skiing pleasure and also has backcountry options and a mogul tour on offer. Jiigatake is a small family ski resort, catered for beginners and families with small children and has little to no steep slopes. Kashimayari offers some tree runs, as well as a snowboard park. The well-known Murasaki Sports chain also has their store here. With the HAKUBA VALLEY TICKET you are eligible to receive a ¥ 1000 food voucher upon your first visit to each of the following resorts: Sanosaka, Norikura, Cortina, Kashimayari, & Tsurugaike. 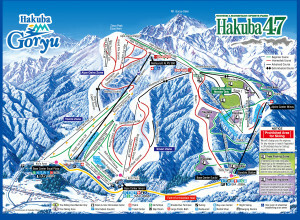 Hakuba is located 270km northwest of Tokyo and 44km west of Nagano City, in northern Nagano Prefecture. Happo village is regarded as the main hub of tourism. 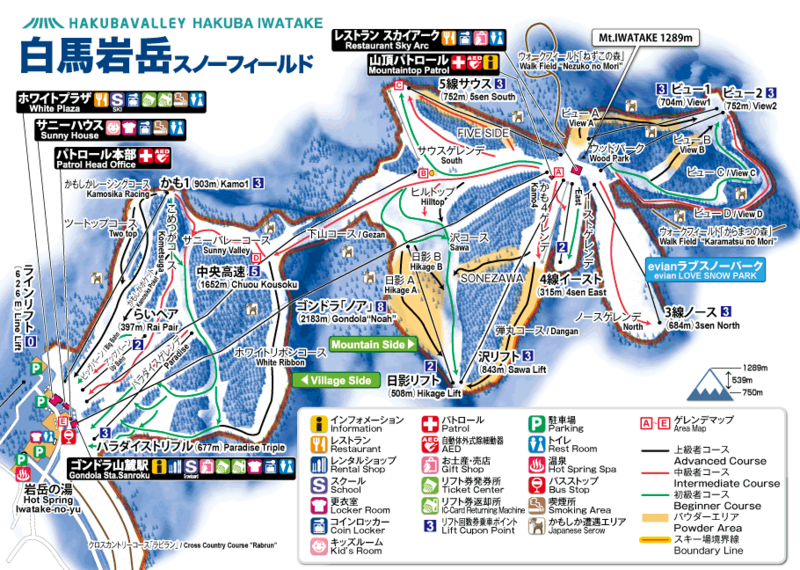 There are several ways to get to Hakuba from Tokyo. Shuttle buses depart from both Narita and Haneda airports straight to Hakuba. 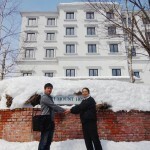 Take the Hokuriku Shinkansen from Tokyo to Nagano (1 hour 40 minutes) and then take a shuttle bus to the resort (approx. 1 hour). Most buses will terminate at the main bus centre in Happo village, so further transport is necessary to accommodation facilities. Depending on where you are staying, organised transport between the bus centre and your hotel may be possible. A shuttle bus runs from Nagano Station to Hakuba. 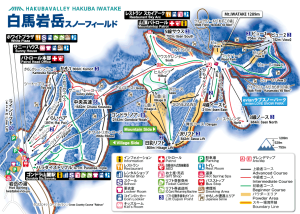 All the resorts which make up Hakuba are within close proximity to each other. To travel between these ski resorts, you will find many hotel-run shuttles and a free public bus system that operates through the valley. There are also buses which connect the various villages such as Echoland and Wadano to the ski resorts, as well as the main village of Happo. Non-skiers will still have plenty to do with each resort offering a range of activities to enjoy the snow, including snowmobiling, tubing, snowshoeing. Backcountry tours are abundant throughout, with each March seeing the introduction of Heli-ski tours. The village is scattered with Onsen hot springs and are the perfect après ski activity to enjoy after a long day on the slopes. The village is also renowned for its nightlife, with a huge number of both restaurants, bars and even nightclubs suitable for all visitors. Day tours are also a popular choice, from scenic and sightseeing tours to tours offering a multitude of unique cultural experiences. Places such as Matsumoto Castle and Zenkoji Temple are popular destinations located nearby. 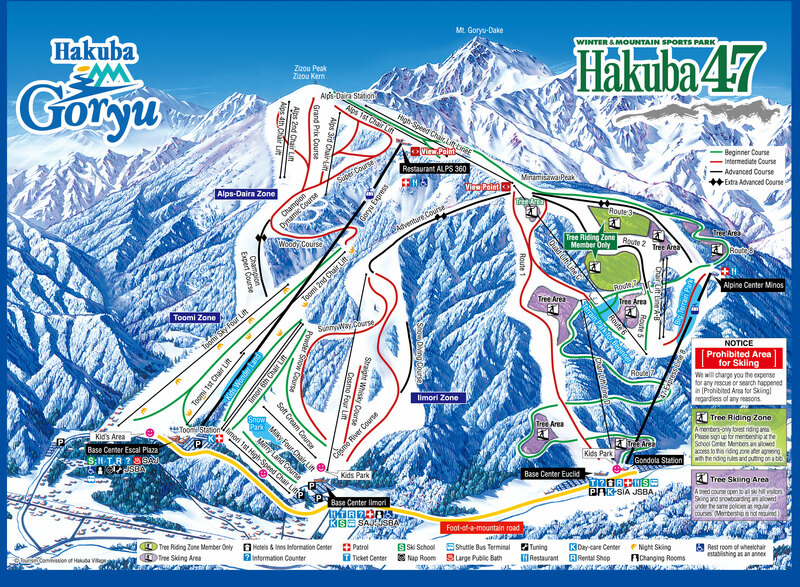 A number of providers are based in the Hakuba Valley area, and offer a variety of tour combinations worth a look. 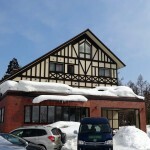 A lot of ski and snowboarding rental shops are situated at Hakuba base, with various hotels also providing similar services. The resort offers a large variety and high quality rental gear and will not disappoint, with some offering high performance gear and other equipment. Some rental providers will have pre-ordering and equipment delivery options available so it may pay to check those out as well. Each resort in Hakuba will have its own corresponding ski and snowboard school all of which provide excellent services and lessons in English for both children and adults. Some will provide on-mountain skiing guidance along with the services of powder clinics. Like the ski schools, each resort provides its own child care services and programs. English speakers, age range and times will vary across different resorts and providers so make sure to check details. Like many other Japanese resorts, Hakuba does not accept credit cards. Therefore, you must bring enough currency for your daily use. However, if necessary there are several in the area including the post office in Hakuba town, the Echoland 7-Eleven, and Happo information centre. Blending into the vast Hakuba forest, which holds glorious natural surroundings a changing face each season, the hotel harmoniously blends in with the beautiful environment. With trees over 100 years old, natural emersion into the area has been a top priority in its construction. Formal yet comfortable Guest Rooms, adequately harmonized with the grate nature. With its elegant entrance hall and high ceiling, this Northern Alps chateau made from natural wood and stone has well-appointed guest rooms with balconies, all of which fit with the natural beauty of Hakuba. Fully enjoy this luxurious resort stay while appreciating the splendid scenery of Hakuba. 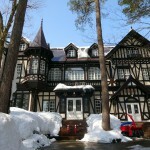 The La Neige Honkan is an English Country Style Hotel located in in the Wada forest at the foot of the Northern Japan Alps in Hakuba. In the gorgeous diningroom of the hotel you can see the seasons as well out of stained glass windows that add a touch of romance to the dinner. 2.Because we live year round in Hakuba and have local knowledge! For more than 20 years, this hotel has been proudly serving our guests from around the world. Weelcoming you, and helping you have a great vacation in this beautiful area.